Correction: This story has been updated to fix an inaccurate count of Japan’s and South Korea’s warship inventory. MELBOURNE, Australia — Amid growing tensions in the region, both Japan and South Korea are reportedly investigating options to operate the Lockheed Martin F-35 Lightning II Joint Strike Fighter on board their respective ships. Quoting reports from unnamed military sources in their respective countries, Japan’s Kyodo news agency and South Korea’s Yonhap said that the short take-off vertical landing, or STOVL F-35B variant is being considered for operations from Japan’s Izumo-class DDH helicopter destroyer and South Korea’s Dokdo-class amphibious assault ship, turning them into combat-capable aircraft carriers. Kyodo’s also reported that the F-35Bs could be used to defend Japan’s far flung southwestern islands, which lack long runways needed for conventional fighter jets to operate. Modification of the ships to operate the F-35B will enhance flexibility and expand the range of missions, with Yonhap quoting a source as saying that the South Korean military is looking at “maximizing the strategic value of the vessel’s capabilities.” The ships can carry several helicopters during normal operations, with the Izumo and Dokdo class designed to carry a maximum of 14 and 10 helicopters respectively. Both ship classes will however need to be modified extensively internally and externally to operate the F-35B, including the application of a thermally protective coating on areas of the flight deck to withstand hot exhaust gases during F-35B vertical landings, and possibly even reshaping the flight deck to allow rolling takeoffs. They will also need to have the ammunition magazines hardened and enlarged to accommodate the F-35B’s weapons, while aviation fuel storage facilities will also likely need to be expanded to account for higher fuel consumption compared to helicopters. 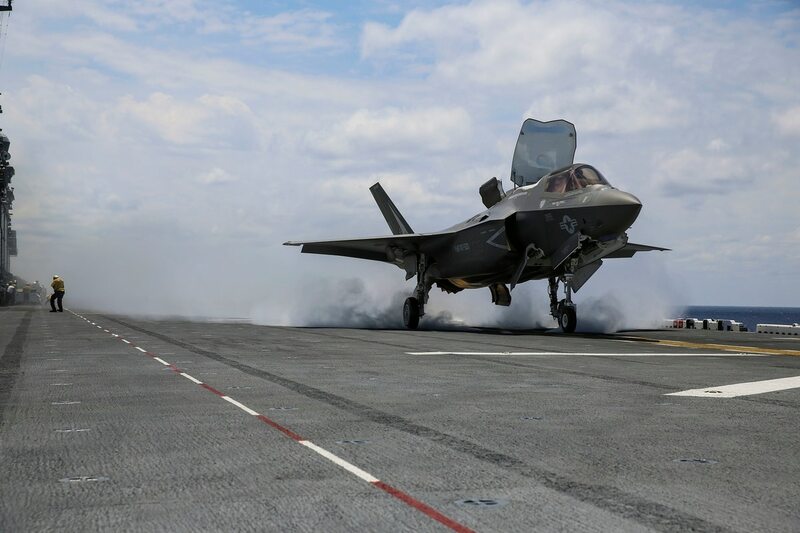 Reuters has suggested that a ski-jump may be fitted to the Izumo as part of any modification program for the F-35B, however with the Izumo-class being 248 meters long and the Dokdo 199 meters, both already have flight decks long enough for the F-35B to carry out rolling takeoffs — no ski-jump needed. Japan has two Izumo-class helicopter destroyers in service, while South Korea has one Dokdo-class ship in service with another being built. The two countries are also operators of the F-35A conventional take off and landing version, with Japan and South Korea having 42 and 40 F-35As on order respectively. An aircraft panel measuring approximately 12 inches by 24 inches dropped from an F-35A sometime during a “routine training mission” about 65 miles east of Okinawa. But Corey Wallace, an Einstein postdoctoral fellow in the Graduate School of East Asian Studies at Berlin’s Freie Universitat wrote in the East Asia Forum that Japan’s constitution does not explicitly ban specific capabilities — offensive or otherwise. Rather, its government interprets ‘war potential’ as referring to the total strength of Japan’s Self-Defence Forces relative to potential threats and international conditions, and not whether a given capability is mostly offensive or defensive.